Finding the right auto paint shop in the Olympia, WA area can be quite overwhelming but it does not have to be. Visit Olympia Auto Body for an excellent service you and your vehicle deserve. As a leading auto paint shop, we offer top-of-the-line auto painting services to clients in Olympia and the surrounding areas. Our auto paint shop works with one goal in mind: to ensure 100% customer satisfaction. Our car painting technicians have the experience and expertise to bring your vehicle back to its previous (or even better) condition in a prompt and affordable manner. We are here to guide our clients through the entire auto painting process. Looking for car painting services? From complete color changes to minor touchups, our custom auto paint shop provides a full range of car painting services to Olympia vehicles. Whether you need new paint job after a collision or you simply need an upgrade, our car painting experts can give your vehicle a gorgeous new look. 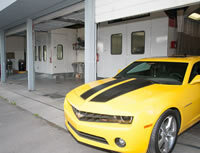 We have been providing custom auto painting services to cars and trucks since 1962. Over the years, we have become the go-to auto paint shop for vehicles of all makes and models. Let us give your vehicle a distinguished look with our auto painting services. You are unique and you want your vehicle to reflect your personality - we can help you customize your vehicle with our custom auto paint jobs. For more information on our auto painting services for Olympia vehicles, contact Olympia Auto Body today. Call us at 253.581.0220. We would love to speak to you!